There are few positions in team sports that can control a game like a baseball pitcher. That’s why a big part of youth pitching instruction has to include patience and positive criticism. 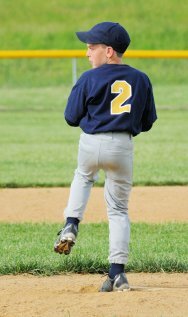 If you are the coach or dad of a young pitcher then always remember the pressure placed upon that position. Maybe a quarterback in football or a goalie in hockey might be close to having the same grip on the outcome of a game. But they both have players around them helping control the play. A pitcher stands on the mound all alone and engages the batter one on one. The game is tied in the bottom of the seventh and the bases are loaded. The coach goes out and offers some encouragement to the pitcher. Just get the pitch over the plate and let your fielders help you out. Let me tell you, much easier said than done. The first two pitches are close, but one was a little outside and the other one inside. Now the opposing dugout is going nuts. Big league pitchers have crumbled in situations like this, let alone a 10 or 11 year old kid. He might come back and get the batter out, but probably not. Nobody at that game wanted the pitcher to throw strikes more than he himself did. You must remember this as the coach or dad. After the games don’t tell him what he did wrong or that his pitching mechanics are messed up. This is the tough part of youth pitching instruction. After the age of 7 or 8 he knows the game turned on his performance. Tell him to keep his head up and better days are around the corner and that you enjoy watching him compete. I belong to the small minority that believes most youth baseball leagues move to kid pitch at too young an age. I’ve seen too many games that were walkathons. But recently many parks and recreation leagues are getting new rules that are helping. Some incorporate a mix of kid pitch and coaches pitch. That being said, the best thing to help young pitchers is for coaches and dads to know and teach good youth pitching instruction. Pitching from a wind up involves lots of moving parts. You have to rock back, pivot on your foot, lean back, turn and throw. Let’s just start with the leaning back and firing the baseball. Many major league relief pitchers pitch only from the stretch. Relief pitchers are often brought into games with runners on base, so they only practice pitching from the stretch. It is how they always pitch. Hey, if it works for major leaguers, it is good enough for me. Ok, let’s go over the pitching instructions step by step. The pitcher starts on the mound facing third for right handed pitchers and facing first for left handed pitchers. His back foot is on the pitching rubber and his arms are resting at his side. He looks in like he is getting a signal from the catcher. He really only throws a fastball, so we are just playing around with the other team by looking in for a signal. He brings his arms up to his chest and gets a good fastball grip on the baseball. Now he leans back towards second base to get some momentum going forward. His throwing arm extends full length behind him. Be sure and teach him to come over the top with his pitches. Throwing over the top may be the most important step in youth pitching instruction. Wildness in pitchers is usually brought on by a break down in pitching mechanics, or tiredness in the arm. Many little league pitchers do not use their legs enough when pitching. You will see pitchers throwing when they are standing straight up. It is important to include in your youth pitching instruction for pitchers to get a good stride and push off for more power with their back leg. It takes some practice to get this right, but most youth pitchers learn it quickly. And the last step in youth pitching instruction is the follow through. A nice smooth follow through helps pitches reach their fastest speed. But even more important, it helps prevent arm injuries. 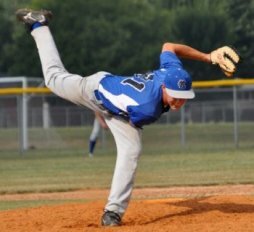 Abruptly stopping your arm after a pitch is very harmful to the shoulder and elbow areas. Teach young pitchers to lean over and try to touch the ground on their follow through. I sure hope these tips help and good luck.